On May 31, 1988, President Ronald Reagan stood on Soviet soil and addressed a packed audience at Moscow State University. 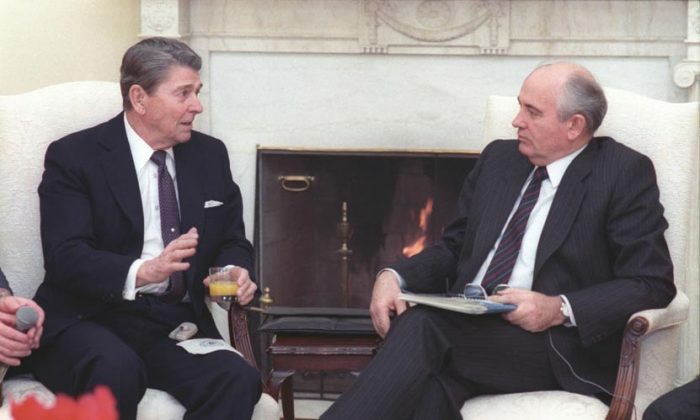 This fourth in a series of summits between Reagan and Soviet General Secretary Mikhail Gorbachev was part of their tireless efforts to reduce the nuclear threat at the time. Reagan understood that this wasn’t a ceremonial visit. Although the world leaders had personal chemistry, Reagan and Gorbachev were combatants, and the winner would determine the future of civilization. How did Reagan get to this point? Bret Baier (the chief political anchor for Fox News), with Catherine Whitney, traces Reagan’s journey in the book “Three Days in Moscow: Ronald Reagan and the Fall of the Soviet Empire.” It is basically a biography of Ronald Reagan, with emphasis on his interaction with Mikhail Gorbachev to end the Cold War. Baier begins with Reagan’s small-town beginnings, his mother’s optimism despite her husband’s weakness for alcohol, Reagan’s early marriages, careers, and the experiences that led him to his firm stance against communism. Then Baier discusses Reagan’s official entrance into politics. A week before the 1964 presidential election, Reagan gave a speech for Barry Goldwater, which became known as “A Time for Choosing.” In it, he talked about the ideals of the American Revolution: having self-government rather than letting the intellectual elite from a far-distant capital run American lives. This speech earned him national attention as the voice of the conservative movement. Reagan’s success was due to the fact that he was a great communicator, but more importantly, an authentic one: He wasn’t putting on an act. After building a network of supporters, he was elected governor of California in 1966, was re-elected in 1970, and ran unsuccessfully for the Republican presidential nomination in 1968 and 1976. Then in 1980, Reagan won the nomination and the presidency, which he held from 1981 to 1989. Much of the rest of the book focuses on President Reagan’s relationship with the Soviet Union. Reagan firmly believed that communism and democracy could not coexist. For this reason, he used militant rhetoric in his speeches, such as calling the Soviet Union an evil empire. He supported anti-communist groups around the world, built up the U.S. military, and initiated the Strategic Defense Initiative (SDI), a sophisticated anti-ballistic missile system to prevent missile attacks from foreign nations. In 1985, soon after Reagan’s second inauguration, a new and vigorous leader ascended to the leadership of the Soviet Union: Gorbachev. Gorbachev recognized that his country was collapsing and needed economic reforms, massive defense cuts, and a transformation of its international relations. The time was right for a summit. Baier mixes fascination and excitement with apprehension and tension as he describes the sessions between these men. Reagan and Gorbachev first met in Geneva in November 1985, and over the next three years, despite their ideological differences, the two men found a diplomatic and personal meeting of the minds and had several summits. They especially wanted to stop the arms race. On Nov. 10, 1989, one of the most famous symbols of the Cold War came down: the Berlin Wall. Despite his successes, Reagan was not the kind of man to look for honors. At a press conference in Moscow in 1988, his last year in office, he essentially described himself as a supporting actor to Gorbachev. In 1988, Reagan had on his desk in the Oval Office, a small plaque with the words: “There is no limit to what a man can do or where he can go if he does not mind who gets the credit.” Words to live by and a man to emulate. Linda Wiegenfeld, a retired teacher, recommends also an adaptation meant for younger readers: “Three Days in Moscow Young Readers’ Edition: Ronald Reagan and the Fall of the Soviet Empire” by Bret Baier with Catherine Whitney.